This entry was posted on October 18, 2018 by Bill T.
Decorating your home in timeless lodge style is either a trend right now, or soon will be again. The décor style is just that popular, and the lodge-style never really goes out of fashion. Elegant and simple at the same time, it evokes a gentler, cozier time and gives you and your guests a feeling of warmth and relaxation that may not be matched by other decorating styles. Luckily enough, decorating in the lodge style doesn’t have rigid rules, either. You’re allowed to bring your own tastes into play as you work to define your own take on lodge style. Of course, you’ll need to know where to get lodge style decor for your home and what to look for when it comes to new and used decorative items, furniture, and fixtures, but we’ll cover all of that in this post. Before you start shopping, it pays to spend some time looking into what’s out there for inspiration and to get some ideas about the look you’re shooting for. Essentially, you’ll want to keep a focus on what will work in the specific spaces where you’ll be decorating. Pinterest is a great place to go and search for decorating ideas. A quick search for “lodge decorating style” will turn up thousands of images for you to sift through, offering ideas and narrowing down what you’re looking for and hoping to accomplish in your space. You may find that you favor a more East Coast Adirondack lodge style, or you may go for a more Western alpine lodge look. Regardless of the style you choose, knowing what you’re looking for will make finding it that much easier. Decorating in lodge style may require a bit of legwork on your part, depending on what you are hoping to do. There are many vintage and antique items that can contribute to your lodge style decor, as well as many contemporary items that you can purchase new. Additionally, lodge style can include objects you harvest directly from nature (or purchase from someone who does). Country stores, farm stores, antique malls, estate sales, second-hand stores, resale hardware stores, and contemporary boutiques can all be great resources for finding items that are lodge style, or at least compliment it in some way. What you’re primarily looking for is rustic or homey items that seem like they’d be completely at home in an old-time lodge in the mountains. 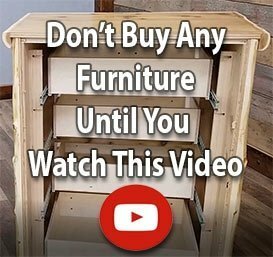 And don’t worry if you can’t find the perfect vintage piece of furniture – online furniture retailers can be a great, quick way to find rustic decor, lodge furniture, and other elements of the look you’re trying to create in your home. Whether you choose to go with antique horse blankets, contemporary wood furniture, nautical instruments as art objects, bent-wood furniture and frames, antique brass and nickel light fixtures, or whatever you think lodge style means—you’re sure to find it. Lodge style is about comfort and bringing a feeling of warmth into the home. Good luck and happy decorating!